DOUBLEOXM: An awesome young artist. My classmate and friend call Lynn (16 years old) loves to draw. And good at that she is. Her forte is in animation drawing, and currently she is doing it out of passion. I talked to her just now, and she told me that she hopes to share her work with people, and is currently trying to sell bookmarks which consist of her own drawing! These are some of her works. For now, the offer is still available. Oh and you don't need to doubt her works, cause it's amazing! 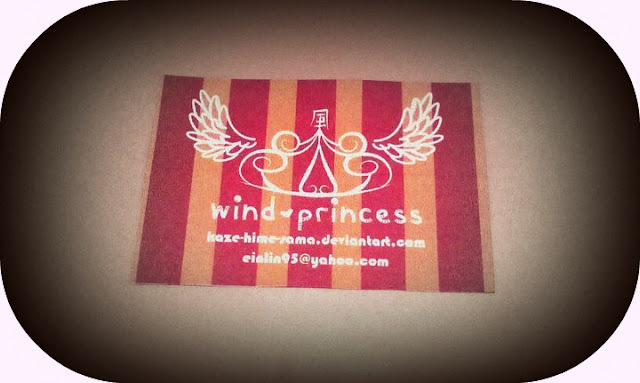 This is actually the front of her name card. I know right! Name card already so pretty! I really love this one. And yes, she created this herself. Copyrighted! This is one of the customized bookmark that I personally ordered! I just told her what I wanted, and BOOM! She draws it and gave it to me within a few days! And well if you're not convinced by all the above.. The pictures above are all requests from her classmates and friends, including me, to draw them. and use that as a reference, and viola! And I bet all of her friends was contented with her work cause I sure did! I am sure she would be able to give you a satisfying picture, bookmark, or anything else that you want it to be printed on. this might be just the right thing! Please also tell us whether you want the bookmark to be in a rectangular or outline form. Important: There is actually 2 types of sketches. The one on my bookmark is chibi type. The rest that my friend drew for her friends one, is call sketch. *note that sketch only can draw the upper part torso, like the pictures there. If you want it to be laminated first, do tell us. Especially those who know her like her CLASSMATES. *hinthint. Let's give her a chance to take her first baby steps here!